More than 1,700 South Korean scientists and engineers gathered Friday to seek ways to capitalize on the changes as the world is transformed by the "fourth industrial revolution." The annual forum -- hosted by the country's largest scientist's group, the Korean Federation of Science and Technology Societies -- was held at the COEX convention center in southern Seoul. "I believe the core value of the fourth industrial revolution is people. 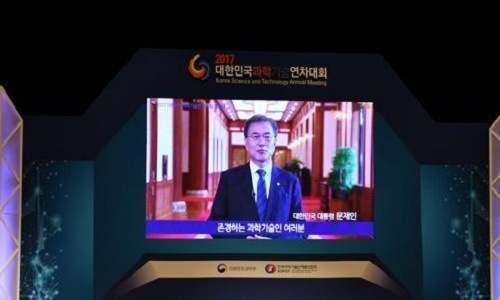 The scientists and technicians gathered here today all face the same value, which is to serve the people," President Moon Jae-in said in his video speech. "The forum is meaningful as it shares the same views that the new government is pushing forward." The Moon administration has been advancing various projects to deal with the revolution that is characterized by a fusion of cutting-edge technologies, such as big data and the Internet of Things. The government hopes that innovative ideas will turn into businesses through science and technology, while generating business opportunities by converging different industries. The chief executive said he will actively listen to voices of scientists while formulating policies by creating a committee under the presidential office. The forum features presentations and panel discussions on topics, such as challenges that the government faces in creating new jobs amid the revolution and the role of scientists in the process. "The core of preparing for the fourth industrial revolution is through science technology, and research and development activities," said Lee Jin-kyu, vice minister of the ICT ministry, further asking scientists to share their know-how with the government to create more quality jobs in the sector. The ministry said technologies, such as IoT and AI, are forecast to generate business opportunities and profits worth 560 trillion won ($484 billion) by 2030. The KOFST has made a number of important policy proposals, such as tax benefits for R&D, the ministry said. Other participants in the symposium include LG Electronics Inc. Chief Technology Officer Ahn Seong-kywon, who delivered his speech on how to seek innovation amid the fast changes. Citing the example of CEO Elon Musk of US-based Tesla Motors Inc., the CTO noted the importance of not fearing failure in the process of making something innovative.